This 2013 50p celebrates the 100th Anniversary of the birth of Christopher Ironside (1913-1992) who was a English painter. As a coin designer, he is particularly well known for the reverse sides of the new British coins issued for decimalisation in 1971. 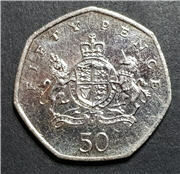 The design is the one which Ironside made for the 50p coin, showing the Coat of arms of the UK. Mintage: 7,000,000 (may include coins issued as part of a set). Minted at The Royal Mint. 2013 CHRISTOPHER IRONSIDE 100TH ANNIVERSARY FIFTY PENCE 50P COIN.